East still a mystery to the rest of the world, and one can only guess what kind of exotic it was in ancient times. 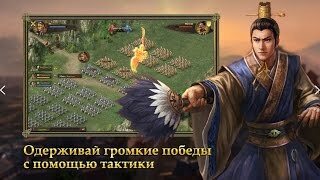 Go to the far lands and thousands of years ago, offers the game Lords of the Ancient World. You will find the charm of Eastern culture, in which they worshiped dragons, martial arts, wars of conquest, strength, courage and unyielding character. The role of the leader you probably know from other multiplayer strategies, where military science is inextricably linked with the economy and diplomacy. To remember the skills you have acquired, begin the Lords of the Ancient World to play, once again at the starting point. Before you a long way of becoming under the guidance of a mentor at first. He gives tasks, at the same time revealing secrets and management features. Thanks to the assistant, by the end of the workout you will have time to accumulate some experience, money and resources in order to set sail with a little capital. Now you can claim your rights to the throne of the empire, but first you need to build a decent army, build up the area with buildings, become powerful. Type of the territory above will show the location of the resource-producing zones around the populated center. Click the mouse to go to one of them, and restore order in the economy for the extraction of timber or steel. Silver, gold and food are also to be accumulated. A now imagine that you are trying, building, improving the newly formed state, and here comes the enemy to attack and take away. Often this is a perfidious invasion without warning, and only the icon that appears tells you that an attack has been made on the house, sawmill or mine. In order to deal with the problem, just click on the icon. Taktika chooses each side before the battle, and in the battle with the bots, the player is given the advantage of the second move, which is just fine. Although the computer brain can be tricky, and already in the course of events change the strategy, so control the situation to adapt. iPlayer Lords of the Ancient World - the game and the historical plot. Adhering to the classics of the genre, the developers still managed to make it special. Where else can one become a Chinese emperor, who gives orders, demands their impeccable execution, subordinates the insurgents to himself and deliberately moves forward to the task set? Lead a great people, and enslave those who do not wish to worship.